I had been promised that bus rides in South America were quite an experience and not for those that value personal space so I was surprised on our first bus ride from Quito to Otovalo. We arrived just in time to purchase tickets and when we got on the bus, only one other person was on board! However, between when the bus left it’s parking place and when we actually started driving, we picked up 5-6 additional stragglers as well as a host of vendors selling everything from ice cream cones to newspapers. They’d come on the bus, try and pitch their wares and then get off a hundred yards later – it was quite entertaining. Our second bus ride was absolutely nothing like our first. 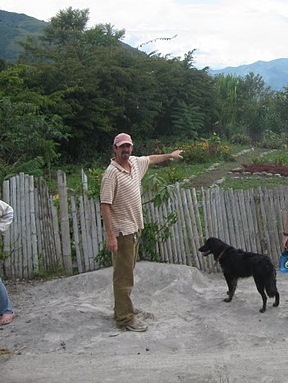 We were headed to Pucara with our friend Peter and as he lives in Pucara part of the time, he was bringing back some supplies for the house he is in the process of building. He was also traveling with his newly adopted dog, Princessa. So there we were, 3 gringos, two big packpacks, a dog and 4 large sheets of glass trying to get on this nearly-full bus. Luckily, Peter had purchased us seats ahead of time or we would have been standing the whole 2.5 hour bus ride to where we were going. As Peter and I finagled our way to our seats through passengers, vendors, kids, old women in their traditional dresses, etc., Ted was outside trying to store our backpacks and hold onto the dog. In hopes of helping him out, I was sandwiched between a large-breasted woman selling limonadas and the glass Peter purchased while taking Princessa’s leash from Ted and holding onto her while leaning out the window. It was absolutely overwhelming and hilarious at the same time. Eventually, Ted gets on the bus, as does Princessa, the vendors make their final sales and we’re off! Once we were in Pucara, the bus system works a bit differently. There are no tickets and few actual bus stops. If you want to get on a bus, you simply wave it down. When you want to get off the bus, you just say so and they stop. Some buses are crowded and some are not. There are a few going each direction each day so you plan your trip around these times and you’re good to go. The bus driver has a helper who gets out to help people with bags store them under the bus. The helper also collects the bus fare from the passengers and is the point of contact if you need anything. The driver just drives. On our way home from some hot springs that we visited on Sunday afternoon, we were waiting at one of the few bus stops for our 6-7 mile trip home with 20-30 other people. When the bus arrived is was already PACKED! I was sure there was no way we’d all fit but sure enough, we were packed in like sardines. In fact, the bus driver didn’t even close the door and two people stood on that bottom step about a foot above the road. At the next stop, I’m not kidding you, they managed to smoosh on even more people – apparently “the bus is full”, is not an option. Lucky for us, we had a short trip home however, many people on that bus were headed over 2.5 hours back to Otavalo and were destined to be standing on the bumpy, windy road the whole time! It’s been nearly a week since our last post but we have a pretty good reason for the delay as we were officially off the grid. Last Tuesday, Ted and I met up with a tourism industry colleague/friend of Ted’s named Peter that Ted had met with a couple of times in Boulder. Peter is American however, he now lives in Ecuador and has for the past ten years. More about Peter and his work in a future post, but he was our connection for where we spent the last week living with a family and learning Spanish. We met up with Peter in Otavalo, Ecuador which is a fairly large town (~40,000 people) known for its weekly Saturday market and a predominantly indigenous population. We then took a very crowded, yet beautiful and entertaining 2.5 hour bus ride along a dirt road (more about the bus rides in a future post as well!) west into the mountains to a community named Pucara. Pucara is a gorgeous little community nestled in the lush Andes mountains, accessed only by dirt road and 5 daily buses. It is one of those places that you drive by and wonder to yourself, “What do people do here?” Well, we were about to find out. After a delicious lunch prepared for us by the shop-owner of one of the two shops in town, Peter introduced to our “sisters and brothers” for the week. Anita is in early 20s and the mother to a beautiful little 10-month old boy named Chris. Andres is her 10-year old brother and Maria is their 6-year old sister. The family lived about a 20 minute walk from ‘town’. Though there were certainly many awkward silences on that initial walk home, we, or Ted rather, was able to break the ice and make conversation. Once at home we met another brother named Victor, who is 23, and the mother/grandmother of the home named Celia. There is also another sister that is 18 but she is away at university several hours away. The family did not speak any English and I am a better listener to Spanish than I am a speaker, so the majority of the responsibility fell on Ted’s shoulders to communicate. The family’s home was modest to say the least. When you walked in the door, there was a central room that was used as the kitchen, living and dining room. There were then four small bedrooms off the main area. Ted and I shared one of the rooms and the other six people shared the remaining three bedrooms. The bathroom was connected to the house but you had to go outside to access it and it was not enclosed. The dishes and laundry were also done outside the old-fashioned way. They did not have a refrigerator or a telephone and in fact, the only electricity they used for their cooking was a blender to make smoothie juice drinks. The cooking was done using a gas stove and a propane tank. There was not room for everyone to eat together so Ted and I sat out in the central room with one or two other people and the remainder crowded into the small bedroom with the tiny T.V. to eat. Though the women (Celia and Anita) were in charge of all the cooking, it was a treat to see that everyone helped out with baby Chris. I was impressed to see how helpful and useful the little guys (Andres and Maria) were to their older sister and little nephew. Everyone took turns holding him, entertaining him and making sure he stayed out of trouble. Though the language was a barrier for me, I made friends with Maria by painting her fingernails with some polish I’d brought from home and pushing her on the swing. Ted brought a frisbee which was also a popular activity with Maria and Andres and a couple other nights we built a fire and burned everything from grass and sticks to plastic bags and track pants (not our suggestion!). Ted spotted a guitar in Victor’s room the first night we were there and after removing a broken string and tuning it up he learned that Victor didn’t know how to play but that wanted to learn. For the remainder of the week, Ted and Victor sat down in the evening and Ted gave Victor some guitar lessons. Though it was certainly a treat to live in this family’s home it was not without its challenges for us (no privacy, bugs, tummy trouble) and for them (two giant gringos with very limited Spanish! ), I’m sure. I’m thankful for the experience and the insight it provided however, I would by lying if I didn’t tell you that I’m excited to be back in a hostel in Otavalo in a comfortable bed, eating whatever we want whenever we want and going to bed confident that we will not be woken up by multiples roosters outside our window!